When a window breaks, it is important to respond to it straightaway, as a broken window can let in outside air and moisture, as well as pose a security risk. However, broken shards of glass can be potentially dangerous for someone who is untrained in handling glass. That’s why, when it comes to window repair, Mableton residents and business owners call upon the professionals at Kennesaw Glass & Mirror. 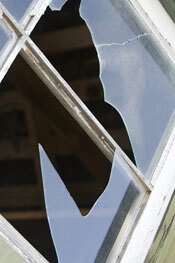 We can safely remove your broken and damaged glass, as well as repair or replace the window, properly and efficiently. Why Choose Us for Window Repair? Our expertise – Each of our glass experts has on average 20 years of experience, so you can be sure the professional you are working with will be able to assess the best course of action for repairing or replacing your window. Our products – Kennesaw Glass & Mirror stocks many types of glass products, including insulated and impact-resistant glass, so you may end up with an even better window than the one that was broken. Our guarantees – In addition to any manufacturer warranties, we also back up our work with a one-year workmanship guarantee, giving you peace of mind in your repaired window. To learn more about the window repair services we provide in the Mableton area, contact Kennesaw Glass & Mirror. We also offer emergency glass repair services, should you need prompt attention to a broken window today.